Whenever progress is blocked in Washington, the pressure for progress always finds other outlets. During the George W. Bush administration, for instance, environmentalists looked to state and local governments for action on climate change, and the result was a slew of commitments that helped build the renewable-energy industry. The same thing is happening now—even more so. With the utter hostility to science on display in Washington, we’re all working hard to persuade cities and states to uphold the Paris climate accord by committing to 100 percent renewable energy. Pioneered by the Sierra Club and joined by groups like 350.org, this drive has had notable success: It’s not just the Berkeleys and the Madisons that have made the promise, but Salt Lake City and San Diego and Atlanta. The day Trump shamed the nation by withdrawing from the climate accord—proclaiming that he’d been elected to govern “Pittsburgh, not Paris”—the mayor of Pittsburgh announced that his city would go 100 percent renewable. That remains one of the high points of the year’s broad resistance. But this move toward the local may turn out to be more than the usual tactical swing. The bizarreness of the president—the ugliness of his politics and the poison of his personality—may prompt many of us to start thinking about the problem of scale in our political life. I live in Vermont. It’s one of the most rural states in the Union, and it’s as white as typing paper. So it should have been, statistically, a fairly Trumpish place: Indeed, New Hampshire just to the east and upstate New York just to the west tilted somewhat in that direction. 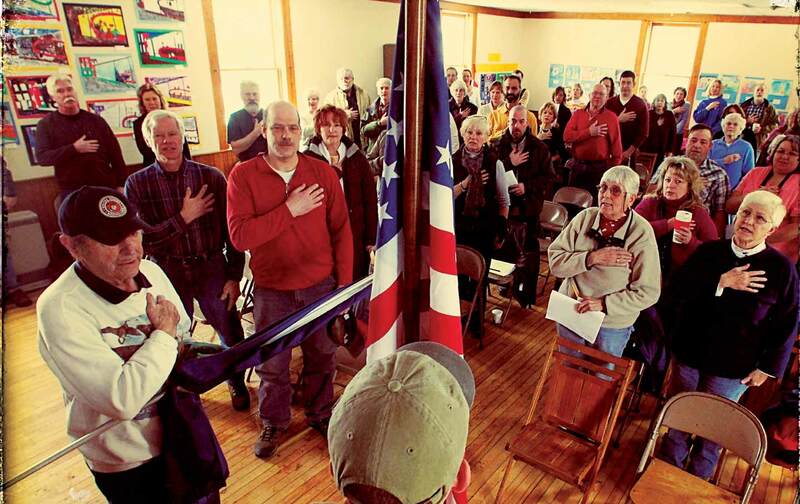 But Vermont did not, and I think it has at least a little to do with the peculiar institution at the heart of our political life: the town meeting. On the first Tuesday in March, everyone in each town gets together in the church hall or the school gym, and there they jointly make the decisions necessary to govern the town for the year to come. Does the school roof have another 12 months left in it? How much should we set aside for plowing the roads next winter? (Occasionally, we also address national and global issues: The nuclear-freeze movement was largely born in Vermont town meetings). One result of this remnant of Athenian democracy is that it’s hard to get away with being an absolute jerk. Were someone to appear at our town meeting using the language that our president uses daily in his tweets, he’d be listened to briefly and then ignored. Obviously, you can’t make a town work with that kind of bellicosity. In fact, I doubt there are many cities that would elect Trump as mayor, because vandalism is less funny when you have to look at the wall every day. But on a vast national scale, it’s perhaps easier for us to be irresponsible, to vote for “shaking things up” or for the sheer entertainment value of watching someone give it to our enemies. And this is one reason why it’s so important to root the resistance in local places, to have City Council members as well as congresspeople and senators. We obviously can’t neglect Washington—global warming, above all, is a reminder that there are plenty of problems that need to be solved at as high a level as possible. But the canker in our political life, the ugly toxins that threaten to wreck us as a nation, may be more easily fought at the local level, where Twitter doesn’t mean much. A strong community is a useful bulwark against hate and stupidity. It’s not a guarantee that ugliness won’t flourish (look at Joe Arpaio in Arizona, a proto-Trump if ever there was one), but even when it does, the damage can be contained. If we’re going to reverse our dire situation, I imagine much of the impetus will come from gritty and real places.